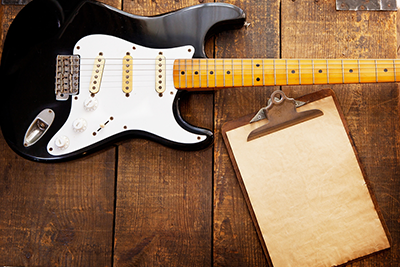 Almost as important as finding the perfect electric guitar, is finding the perfect strings. Do you like the feel of thick strings or thin ones? Most electric guitars use thin strings, but if you are an avid acoustic guitar player, medium gauge strings may feel more familiar. Look for brands like Daddario as well as Elixer. The Elixer strings outlast any other string on the market, but take more time to 'break in'. The bottom line is that you must try several and see what fits. The electric guitar string must be stretched in the beginning. You don't want them falling out of tune every time you play the electric guitar. For guitarists gigging and playing through an amp, the choice of string will differ between that of a hermit, sitting at home recording. As one plays, the finger oils and dirt start building up on the guitar. Even after one practice session, there is a ton of dirt on the strings, which affects tone and can make it muddy. To rememdy this, grab a can of Finger Ease and spray down the fretboard after each play, followed by wiping with a paper towel. You will notice the massive amount of dirt that cam off your hands, which you thought were clean! 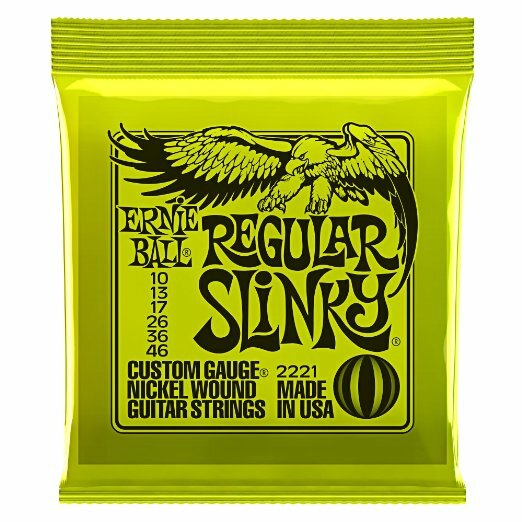 The award for most popular electric guitar string goes to Ernie Ball 2221 Regular Slinky Nickel Wound Set. These are regular in tension and fall right in the middle of electric guitar playing. They are a great place to start for the beginner due to their ease of fretting. These strings tend to last a good while, before they become dull.